What Do Shin Splints and Flat Feet Have to Do With Each Other? Everyone is unique. This is something we are told many times as children and it is true on a variety of levels. While most teachers and parents mean that each person has their own thoughts and feelings, it’s also important to realize that each person also deals with their own unique configuration of inherited physical traits that often get in the way of optimal physical activity. Some people have asthma which limits the amount of heavy breathing they can do comfortably, while others have weak knees which reduce the amount of time they can run. In addition, a surprising number of people have flat feet which put them at an increased risk for shin splints. Why do people with flat feet get shin splints? Let’s find out. For the vast majority of the population, whether a foot is pointed in the air or pressed down on the ground, there is a definitive arch. The inside edge of a healthy foot can never touch the ground at the same level as your heel and ball because it is held aloft by a taut cluster of tendons pulled tightly between the ankle and the base of your toes. Like an archery bow, because of this tendon, the foot cannot sit flat and the arch provides springy support to each step. People with flat feet, on the other hand, either don’t have this tendon at all or the tendon is strung too loosely to hold the foot tight. This creates what is medically known as Pes Planus which translates roughly to “feet like plains”. You can tell if you are flat-footed simply by taking off your shoe and pressing your foot to the ground. If the place where your arch is supposed to also touch the ground and your ankle rolls inward easily, you have flat feet. This will make it harder to maintain proper posture both standing and running, causing your feet to hurt often and increasing your risk of exercise-based injuries like shin splints. Now that you understand flat feet, let’s talk about shin splints and see if you can figure out why the two are related before the end of the article. Shin splints are something that happens to most people as a result of running, jumping, falling, and occasionally walking. The clearest sign that you have accidentally contracted shin splints is a pain in your shins during or after active exercise on your feet. Shin splints occur when the footsteps land too hard on the ground with a force greater than what your muscular and skeletal structures are prepared to support. 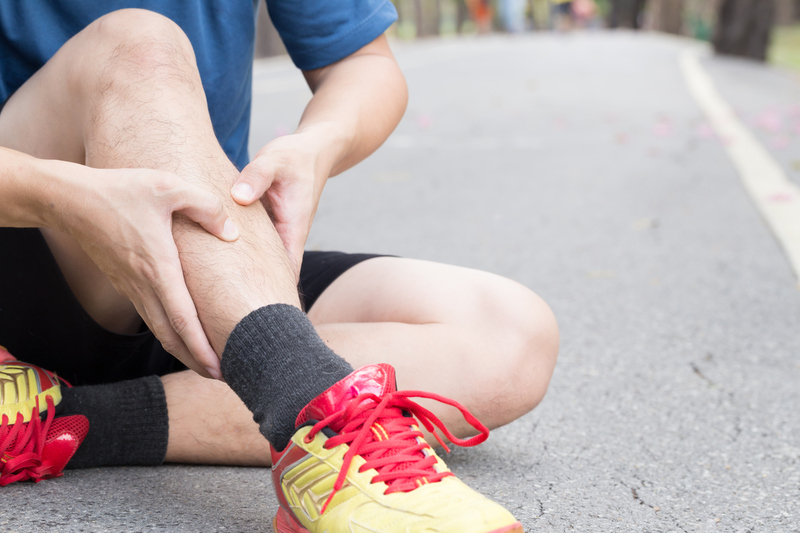 Even if the muscles in your legs are quite strong, if your bones are impacted vertically by a step, you may experience pain, achiness, and swelling at a specific point in your shin. Your shins may also be tender and sore in response to gentle probes. If you or someone you know has flat feet, there is a significantly increased chance of shin splints during exercise. The reason for this is that the springy arch that most people have acted as a shock-absorber, much like in your car when you go over a pothole. Every time someone with arched feet lands a step or a jump, that tendon stretches like a rubber band and absorbs some of the impacts which keep it off your shins. People with flat feet don’t have this shock-absorption so your shins are likely to take more impact damage with every step, whether you’re running, walking, or jumping down off of something. People with flat feet are used to a little bit of foot and leg discomfort as a natural part of having an imperfect foot structure. However, the pain associated with flat feet is usually felt in the bottoms of your feet and possibly your knees and hips. If you start to feel pain, achiness, or tenderness in your shins, it’s time to see a medical professional. For more useful information about foot care or shin splints, please contact us today.